Home > Blogroll > Novel Idea: How about Postponing the Election? If democracy is to work, the responsible thing to do is to acknowledge when it is not working as intended, so that appropriate changes can be made, not by the politicians, but by The People. It begins with changes in thinking, from which new choices and behavior will follow. The election of the president is not a popularity contest, nor is it to select the one who is least unpopular. Finally, it is not about a particular party. If representatives from both such parties have set aside the principles that are thought to guide this society, then the participants lose their relevance. If principles are prime, then each candidate for office, and each successful office holder, must represent them, during the campaign, and during their service in office. There is sufficient, confirmed evidence to conclude that the American People have been deceived, and the 2016 primary and candidate selection process has been compromised. A specific agenda has been put forth that centers around “flaw and disorder,” terror management, continued fiscal and personal indebtedness, and ever escalating costs for health care. NO real initiatives related to peaceful co-existence, environment protection and restoration, measures that bring health care costs down, and a fundamental change in monetary thinking that has already swept the rest of the world, have been offered. NO intelligent or mature mention of the presence of sentient life that we must prepare ourselves for, by knowing and loving ourselves as a foundation to productive interacting with others. We continue to think of the Malthusian Model of Earth as a fixed, limited pie, when it is, in fact, a most capable, malleable, and expandable canvas upon which to create life experiences that will benefit ALL. We think that for each “winner” one must “lose”, that wars are events that can be “won,” “death” is the end of Life. As such, we thinking “killing the enemy” is a practical solution as lies and deception can no longer be concealed, and the truth, revealed. We’re in such a time now. There need not be war. There need not be conflict. There is enough for all. There can be health. We can heal ourselves. More people can prosper, living the highest and best quality of life that they imagine. There is plenty to joyfully do to turn our communities and planet around. The Universe is without limits. Only imaginations are limited. We have suffered the consequences of limited imagination syndrome (LIS), and have done great damage to the planet, while traumatizing the human psyche. Both can be healed. Toward the beginning of such dialogues, I suggest that we put the election, scheduled November 8, on hold. Some unethical, illegal, and treasonous actions were taken, and have been ongoing, involving one of the candidates. Specifically, Mrs. Hillary Clinton. She is the tip of a much larger iceberg that must be addressed, unraveling her situation will lead to others. ALL people who serve federal and state governments are not “bad.” Few are aware of the deception and deceit that dominates government, education, agriculture, military, science, and media, and has done so for many generations, even before the settling of this society in North America. Fraud cannot knowingly be tolerated in the election process and voting system. There is no way that anyone can have any assurances that The Will of The People will be heard (and heeded) unless referendums that the People want are presented and aired, and the election system itself cannot be compromised. As of this moment, neither condition is in effect. All of the primaries, all the noise, and all the debates, have been woefully low in substance. Major issues have been ignored by the media, and has become our excuse to remain silent and inactive. Please examine the report lined above. Here’s an example of systemic indifference that should be addressed during the election season. 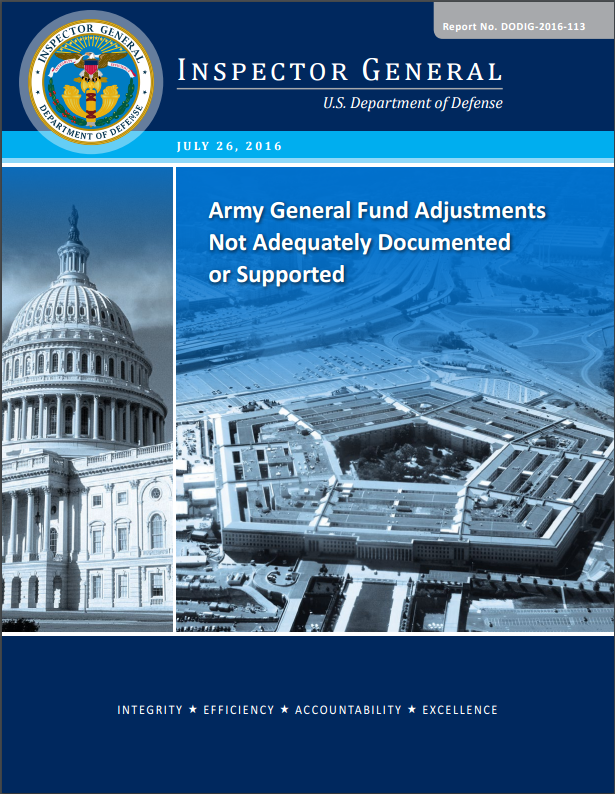 The Inspector General report, dated July 26, 2016, for the mis-named U.S. Department of Defense (it should be called Department of Offense) discloses that Army General Fund Adjustments are not adequately documented or supported. The Report is number DODIG-2016-113. You can download the entire report by clicking the provided link, but here’s the seed talking point for today. Army and Defense Finance and Accounting Service Indianapolis personnel did not adequately support $2.8 trillion in third quarter adjustments and $6.5 trillion in yearend adjustments made to Army General Fund data during FY 2015 financial statement compilation. News outlets report this as an accounting error. I submit that events such as this happen on purpose. $2.8 trillion was unaccounted for in the third quarter alone, with $6.5 trillion for the fiscal year. These are not singular events; this is a pattern of money management; an unchanging pattern. As such, more “losses” should be expected unless the pattern is changed. The auditing agency isn’t responsible for the pattern, just the recording. Donald Rumsfeld reported that $2.3 trillion was missing on September 10, 2001. September 11 appears to have been the end of discussion, but the pattern didn’t change. We’ve heard the term, “too big to fail,” related to banks. Well sums as large as this, even if it’s all handled electronically, are too large to “lose.” You can bet that some official knows where it is and what it is being used for. Maybe this is an example of the private, or back office system that Hillary Clinton told the Goldman Sachs people it was necessary to maintain. Here is the public system that many of us know too well. 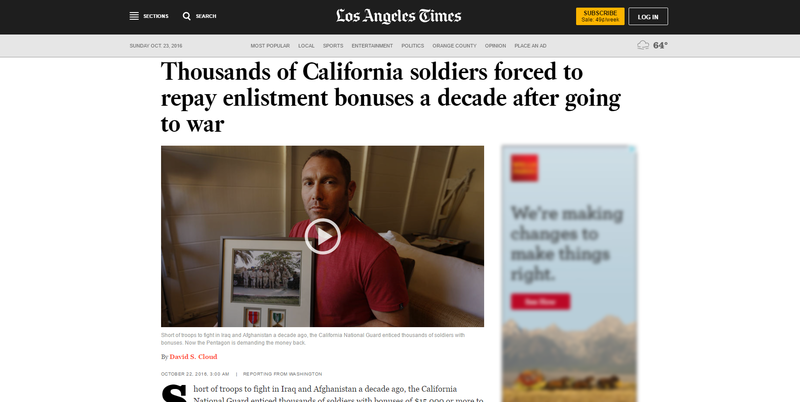 Consider the above story from today’s L.A. Times, where the Pentagon is demanding repayment of $15,000 bonuses that were paid to nearly 10,000 soldiers who re-enlisted in the California National Guard to fight in Iraq and Afghanistan a decade ago. 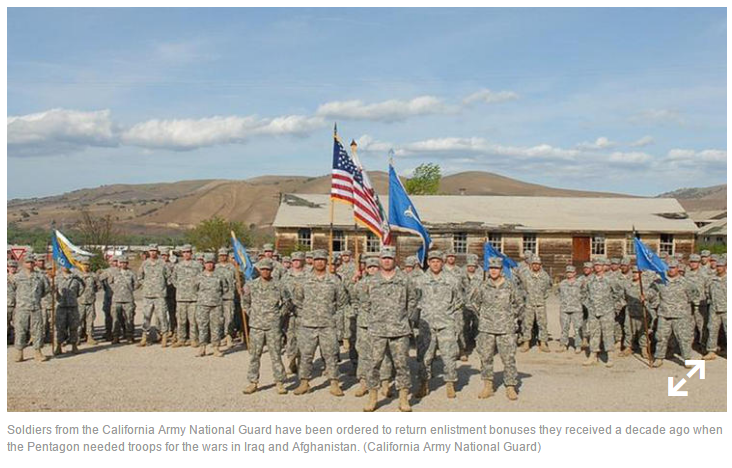 Interest payments, wage garnishments and tax liens are being used against these veterans, while California Guard officials were under pressure, by the Pentagon, to meet enlistment quotas. These people, many of them children when they enlisted, believed they were “doing good” and showing “bravery” to “Keep America Strong” (and other platitudes). They do not know how they are used to weaken the social structure of people in other countries, for reasons that are “trumped up” far beyond anything the Republican presidential candidate would believe possible. It shows the great irony that one hand of the military can be so picayune and callous toward veterans who rendered their services to try to recoup $150,000,000, while another hand “loses” an amount that is 43,333% higher, and no one raises an eyebrow. This is just the evidence that people will need to see that they are getting lousy representation from virtually all factions of today’s society; the principles of which we still hold dear, but are not played out in actual practice. For this reason, and those articulated in the video that I uploaded yesterday (and available here), I suggest that it is appropriate to HALT the present election, because we are not choosing a government that represents, or even respects the people it purports to serve. It is better to halt and fix, rather than try to vote and “win” a tainted election and electoral process. You still question whether it is tainted? This is not about keeping Mr. Obama in office, for he is part of the same flawed (to put it mildly) system that polarizes and exploits all. It is about getting true representation and restoring integrity into the electoral process. It is about discussing and choosing methods and solutions that will benefit the country because we now know that current conventions are unsustainable. The Constitution may not provide, as one report I found indicated, guidelines for postponing and rescheduling an election, but there are also no guidelines to follow for tyranny either. But you wouldn’t expect the people who run the system, to necessarily think that (1) they’re doing anything wrong (although those people who diverted $6.5 trillion are less concerned with disclosure than Hillary Clinton), or (2) that we can object enough with the power to stop them. When those veterans see how the service that they rendered and sacrifices they made were in vain, and policemen and women, and gang members see how they have all been used to foment divisiveness and fear in their neighborhoods, communities, and cities, they’ll begin wanting to live with their own conscience again, and know joy, peace, and health again.